Thrilling political machinations, alien yet relateable characters, and a compelling space opera aesthetic combine for the start of an epic new series. Writing long form book reviews is sometimes very hard. Sometimes, that's because there's not much to say about a book, or because life is busy and finding time to bash out a thousand words on recent reading is a struggle to manage. Occasionally, though, it's because it feels like there's nothing to say about a book except "I loved it, I loved it, I loved it," which while not totally uninformative for a prospective reader, probably isn't going to be terribly useful either (unless you really trust me). Somehow, in these moments, more words must be found, somehow, from somewhere. So, A Memory Called Empire. I loved it. This is the start of a new epic science fiction series from Arkady Martine, an author who is new to me, but already has a very interesting short fiction bibliography. In it, we follow new ambassador Mahit as she is posted from the stations of Lsel to the Teixcalaanli empire, a hugely powerful neighbour where conformity with social norms is everything. Luckily for Mahit, Lsel has perfected the creation of the "Imago" - imprints of personalities from deceased people which impart their users with the skills and understanding of their predecessors. Less luckily, Mahit's predecessor Yskandr hasn't updated his imprint for fifteen years - long enough for fashions to go out of date, political movements to change course, and for his networks and, more importantly, the identity of his apparent murderer to be a total mystery. Both Lsel and Teixcalaan have problems greater than the death of a single man, though, as the former finds itself under threat from a larger alien power, and the latter gears up for a potential succession crisis once the current Emperor dies. At least Mahit should have the first few years of Yskandr's experience and his company to rely on! But, nope, her imago malfunctions almost immediately on arrival, leaving her almost entirely alone in the tensest of political situations. Fans of Ann Leckie and Yoon Ha Lee (not to mention the Hainish cycle) will find Martine's worldbuilding an absolute delight. It's in the same vein, of spacefaring human cultures that take in the full richness of human potential to create worlds that are utterly alien to each other and to us as readers, while not being derivative of anything specific from those other examples. In Teixcalaan, people smile just by widening their eyes; parties get exciting when everyone gathers around for impromptu poetry about station cleaning methods; peoples' names are all made up of a number and a noun; and it's impossible to so much as open a door without a "cloudhook", a wearable personal computer only issued to citizens. Though we don't spend much time there, Lsel's culture is a little more recognisable in its hard-nosed spacefaring utilitarianism, but there's uniqueness injected here too, particularly the "imago lines" passing down generations of skills and personality in expert industries, as well as some fascinating (though thankfully not heavily explored) references to ritual cannibalism. The dynamic between the huge, outwardly glorious Teixcalaanli empire and Mahit's own culture - Lsel station itself holds just 30,000 people - is also very well played out. Mahit is desperate for friendship and connection with the Teixcalaanlitzlim, having grown up steeped in the culture and art from afar, but is also all too aware that, to them, she is a "barbarian", who will at best be humoured for her inability to ever fit in. It's left ambiguous how much of this is Mahit's own hangups and how much is genuinely coming from the people around her, but Teixcalaan's sense of cultural self-assurance is vividly present in all aspects of the worldbuilding, particularly the city's language and technology. At almost every turn, Mahit's already complex circumstances are further complicated by being an outsider in an empire that simply doesn't know how to accommodate difference: not through malice, simply through the weight of internal homogeneity. That her perceptions of being an outsider are confirmed not by the malice of those around her, but by ignorance, makes the whole situation that much more heartbreaking. 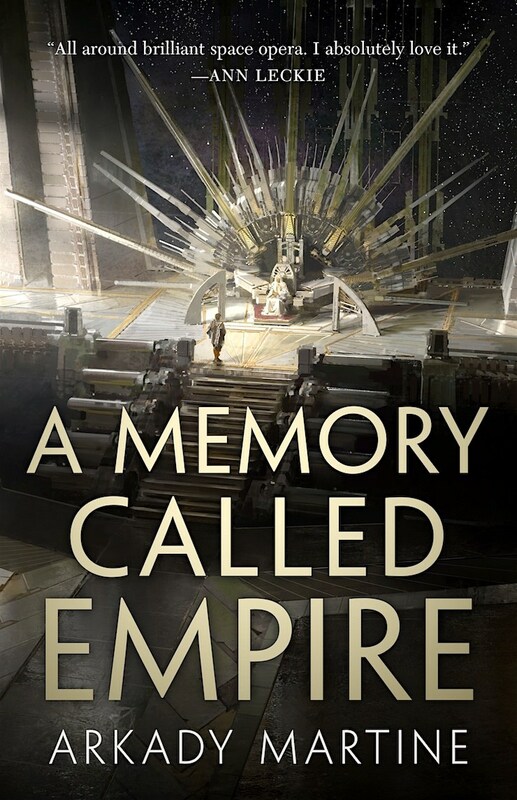 With all the weirdness and tension, the world of A Memory Called Empire could have become quite a dry, unpleasant affair, but Martine completely avoids that fate. Indeed, what surprised me most about the novel is how imbued with humanity and compassion it is, despite the subject matter and the relative isolation of the protagonist. Much of this is down to the interactions between the core characters: in particular, all the scenes with Mahit (a competent but fallible young woman in politics, my favourite), her cultural liaison Three Seagrass (previous parentheses also apply), and her childhood friend Twelve Azalea bursting off the page with life and feeling at every turn. Because Mahit's outsider position is such an integral part of the plot, there's a careful balancing act to be done between demonstrating that outsider status and the very real shortcomings of the Teixcalaanlitzlim in addressing it, while also imbuing the rest of the characters with their own alien-but-recognisable motivations, sympathies and responses, and it's pulled off remarkably well. Plotwise, the novel also delivers, although Mahit is a very particular sort of protagonist: a young woman with a non-violent skillset who is completely out of her comfort zone, whose sense of agency is calibrated accordingly. Again, I think this is a feature rather than a bug, both in terms of Mahit's specific characterisation and in having an immensely human-driven narrative. For example, in one section, our heroes are caught up in action and unable to sleep for 30+ hours, and the sense of exhaustion and tiredness is so very well realised, in the decisions that the characters make and the way the situation is described, that I could literally feel the discomfort leaping off the page. There's something wonderful about an author developing an "alien" city of far-future humans, and then having some of those humans sit on a college green far too early in the morning eating ice cream and napping off two days of exhaustion, without making either element seem out of place. If I have a criticism, it's that the weight of the "institutional" threats can't quite keep up when the personal isn't involved; that's not such a problem when the threat of civil war is looming large over characters' emotional and physical well being, but it does make the long-term threat to Lsel harder to connect to. Still, at the end of it all, I came away from A Memory Called Empire feeling very, very lucky to be a reader right now; I'm so grateful that this particular brand of smart, interrogative, fun fiction is being written and published and put in conversation with similar work, right here and now. This is a hugely exciting work - hopefully the start of something big and equally exciting - and I highly recommend you offer it a space on your 2019 TBR. Penalties: -1 Room for growth in the wider plot with the looming alien threat. Reference: Martine, Arkady. 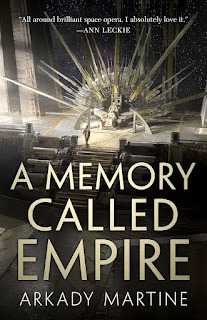 A Memory Called Empire [Tor, 2019].